And so we are in the midst of Holy Week. It came with a shock this year, as we watched the Cathedral of Notre Dame burn in Paris, a loss for which it is for many of us impossible to find words. Holy Week is a time I hold dear, even though I don’t think of myself as a particularly religious person. I write about all these holidays, these holy days, and they hold vast spaces in my heart, and I listen to an awful lot of sacred music and I sing hymns as I go up and down staircases, just because I like them, and I feel sick about Notre Dame, but more for its beauty and history than anything else. My connexion to things religious is mostly, for better or for worse, human. I say a silent grace before meals, when I think of it, but more often than not there is already a forkful of dinner in my mouth when I am beginning to say it. And I pray, mostly when I’m driving to work each morning; at some point a few years ago I decided I could make better use of my time during my daily commute if I switched to prayer instead of all the cursing and swearing that had, up until that point, been more typical of my drive. These things are in my DNA. As a grandson of early 20th century Italian immigrants, I grew up with St. Anthony in the backyard. In the house, there were all manner of saints and blessed virgins under glass domes on bedroom bureaus and crucifixes hanging on the walls and prayer cards with saintly images leaning on picture frames. St. Joseph, St. Rocco, St. Anthony again, the Infant of Prague, Santa Maria della Vittoria––the Black Madonna of Lucera. The year after my grandpa died, which was just after I graduated high school, there was, during Lent, forty days and nights of Adoration of the Blessed Sacrament at our neighborhood church, St. Paul’s. I wanted to keep Grandma engaged. I had no idea what Adoration was, but Grandma expressed an interest, and so I brought her the first night when Lent began. And I brought her the second night. By and by, I brought her each night that week, and each night after. I don’t think we missed once, all through those forty nights. We would sit there, she and I, in the dark candle-lit chapel. Grandma would mumble her prayers in Italian, we would chat quietly, we would sing and pray when the priest came in to sing and pray with those of us who were gathered. We made friends: Father Brice, the pastor, Father Alonso, who was from Spain and who spoke so slowly that Grandma had no trouble understanding his English, Pat McAuliffe, the woman who made sure everything in the church was in order, and who often was out of her shoes anytime you entered the sacristy unannounced. Grandma and I would go late in the evening, maybe 9:30 or 10, and stay past 11, every night for forty nights. It was one of those things I never would have imagined myself doing, but I did it for someone outside my self, I did it for Grandma, and it turned out to be one of the most special things I’ve ever experienced. Which is often the case when you step outside your self and do things for others. 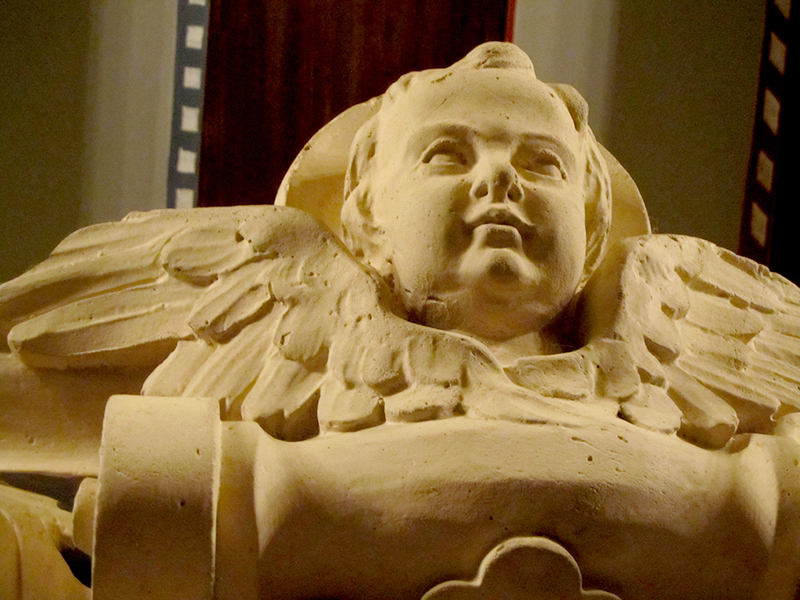 It was probably those forty nights that fostered my love of churches at night. And so it is that I have come to love another of Grandma’s traditions: the visitation of three churches at night for this same overnight watch on Holy Thursday, Maundy Thursday. And still, all these years later, you will find Seth and me doing this on Holy Thursday this week, as we do each year. When we go and sit there in the still and candlelit darkness, I do pray a little, but mostly I just sit. I am right up against Seth, usually, but I also have Grandma nearby, and all the people who have come and gone in my life. We are all quiet, taking in the creaks of the building and the sounds of passers-by outside the doors and the flickering of the candles. This year, I suppose, I’ll have Notre Dame with me, as well. The heart expands, and expands. Friday is Good Friday. I have never, in all my life, been to church for a Good Friday service. Each year I think maybe this year I’ll go. And maybe this year I will go. I have taken the day off from work, so that’s a good start toward the possibility. Friday night will, as well, begin Passover. It is a high holy week across faiths this year. Saturday brings Holy Saturday, the Easter vigil. Some years, if we have it in us, we endure the Vigil Mass, which can go on for many hours. It can begin only once darkness falls, so it is a late night. One year I really wanted to go but couldn’t for one obligation or another, so I went to the Creole service that began at 11. I was the only person there at St. Ann’s who was not Haitian. I was warmly welcomed, but my French is rusty and my Creole not much better and though I could understand only very little, still I could follow along. This, through years of experience. We sang in Creole, people shook my hand and offered me the sign of peace in Creole, and when we stepped out into the night onto the city street, it was well past 1 in the morning. I felt light and at peace. Again, one of the most special things I’ve experienced. And maybe this is what I love about Holy Week. 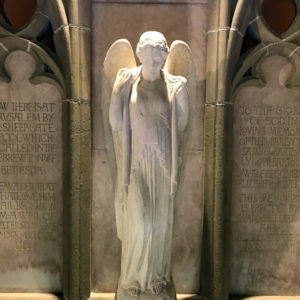 No matter how far I’ve strayed, I always feel welcome in the churches I visit on my journey this week, especially on Holy Thursday, that somber yet beautiful night through which many of them will keep their doors open clear through to the next morning, for we are invited: to keep watch, and to be present. The distant moon, our constant companion. Along with it, the ocean breeze, the silhouettes of palms. It is the most beautiful time of year here in Lake Worth. Open, welcoming, warm. As Lent concludes and we ponder the mysteries of this week and as we approach Easter… this warm, welcome openness I wish for you, as well. Image: When I am visiting churches on Holy Thursday night, I like to wander around. I’m not sure if it’s sanctioned or not, but nonetheless Seth and I tend to wend our way into chapels, peep into unlocked doors, ascend staircases. 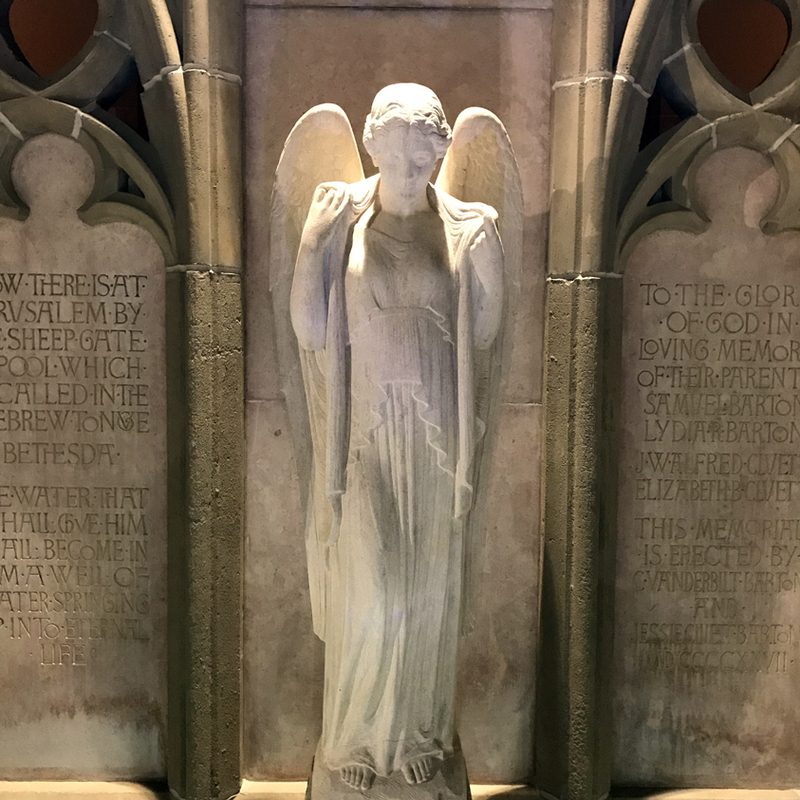 This angel greeted us in an upper choir loft of one of those churches, perhaps St. Ann’s in West Palm Beach or St. Edward’s or Bethesda by the Sea on Palm Beach. Music for the week: Several years ago, the Boston Camerata released a wonderful collection of songs for Holy Week. It’s called “Lamentations: Holy Week in Provence.” It is exquisite. I’ve been off from work this past week, and it was a wise move, taking off for Holy Week. The days were spent on projects and in preparation. I got to spend time with Seth and with the cat as I finished binding a book that someone had ordered and got to work in earnest once more on the book proposal for the Convivio Book of Days. I started fresh, fresh like spring, and I feel better about the proposal I’ve begun this week, much better than the one I began last fall. My friend Cricket gave me a bag of coffee as inspiration for my writing, and all that’s left is enough for one cup: the cup of coffee I will have when I send her the finished proposal. We also got to help my mom and sister with Easter baking and we got to go on our annual Holy Thursday night pilgrimage of three churches. It was Seth and me on that pilgrimage and we were out late into the moonlit night. So beautiful. And this year I got to do something I had never done before: I went to church for Good Friday. And that was fine, church was. 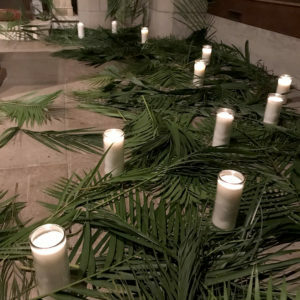 But the sermon made me uncomfortable and I felt a bit disconnected, until it was all over, when we all left the old church in silence, as we are to do on Good Friday. But as we left, I could hear the sounds of the Creole choir, also from our church. The Creole congregation were in the midst of the Stations of the Cross, outdoors on the sidewalk in front of the older church building, the one from the late 1800s. Their music drew me in and I gathered round the old church with them, leaning up against a live oak tree. They were at the final station. There was wailing and sorrow and there was singing I had never heard before but which sounded so familiar. They made their way then to the main church, the larger, newer one, the one built in 1913. They entered, singing, and I went on my way, content, happier for having run into this extension of myself. Saturday night, I’ll be back, for the Easter Vigil. It is the hours-long Mass that brings in Eastertide. It can begin only after darkness has fallen, for it is then the third day, which used to confuse me a lot until I realized that different cultures have different ways of reckoning time. No one way is right, for time is such a fluid thing and yet an invention of our making. It will be the beginning of Easter and the second night of Passover, too. We will be there, sitting, standing, kneeling, singing, praying, in a service that will begin in darkness and end in light––a central theme to the Easter Vigil. A fire is kindled and the one light is the source that illuminates all the candles in the church: the candles on the altar, the candles we hold cupped in our hands. We are reminded that light overcomes darkness. We are invited to be that light.